Here are all the bad and negative news over the 2 past weeks. 1) KLCI Roughly lost ~10% in just 12 trading days. Across the board, most stock roughly easily lost around 20%-40% of their value. 2) KLCI From high of the year, lost ~16%!! 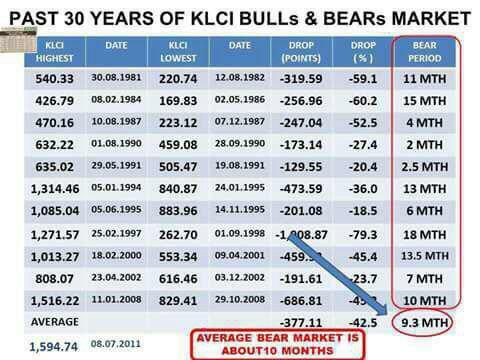 Average bear market is 9.3 months and we just into 4 months if we considered the high of the year as the start point. 3) Ringgit broke the 4.00 USDtoRM support, and continues to free fall. Also lost ~10% in similar duration. It hit all time high of roughly ~4.2! Yet, BNM kept on telling itself that a peg is not going to happen. And our 'too clever' ministers kept blabbering that a super weak currency is good for tourism, economy!! 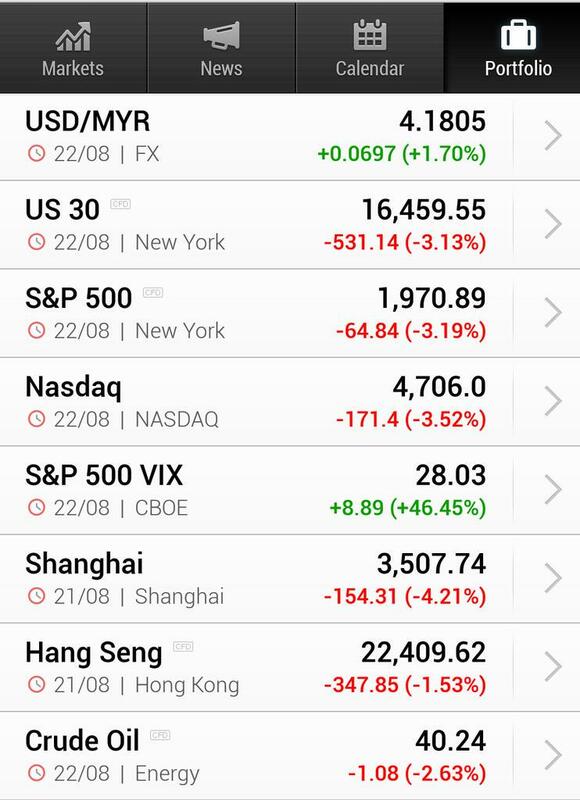 4)The Chinese market implodes after meteoric 1 year rapid rise; bans short selling, alot of Chinese govt intervention into the market.China devalues the Yuan, another blow to ringgit and global currencies. 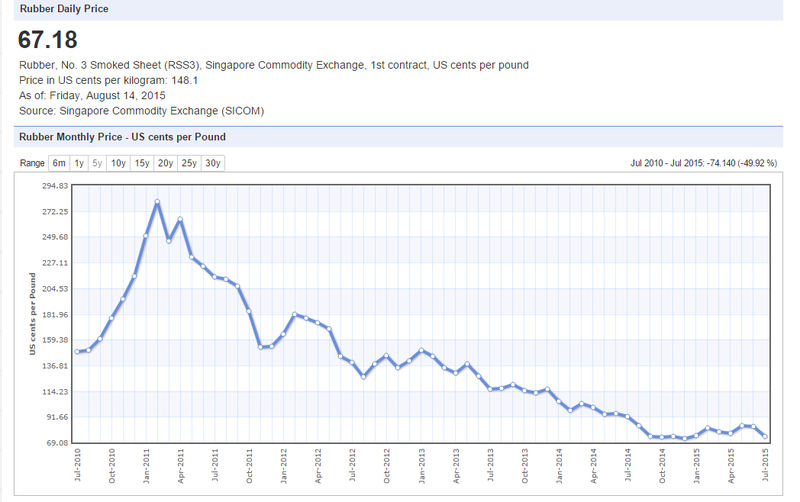 5) Malaysian commodity (palm oil, oil & gas, rubber) prices are all falling to year lows. This is very bleak & dark sign for the economy especially since oil is a major contribution to our countries' revenue. Malaysia still depend on agricultural produces like palm oil & rubber as export, the never-ending falling prices is a grave concern. (hitting 5 year lows). Felda Group once boasting itself as one of the largest world IPO debut is now languishing in its stock prices. 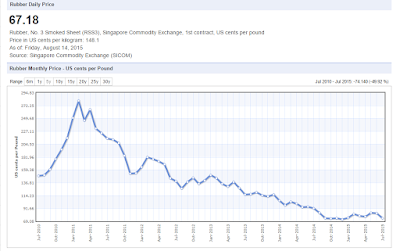 (besides the weak commodity prices, I honestly believe their management is also very 'weak' too. Other listed plantation companies can even book some small profit during the same timeframe) I pity those Felda pioneers who applied loans just to buy into its IPO during the peak. Now they are stuck. The lastest news, I read is that I think FGV is considering to buy an Indonesian plantation company. Don't think it will be a smart move since it will drain their cash flow and they should fixed in-efficiencies in operation back home in Bolehland first before venturing again. Plus, weak palm oil prices. 6) US markets are tanking too recently. Last Friday, DOW just lost 500 points! And their analysts starts to paint a bleak picture although that might be tad too early. 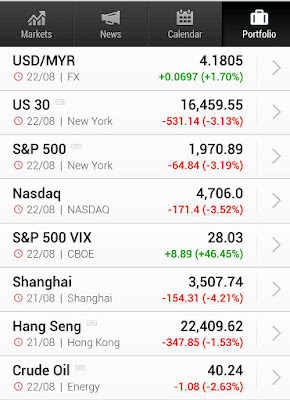 Remember, next year will be the US elections and this tends to be a feel good factor to boost up the markets. (You should watch Jon Stewart shooting down presidential hopeful Donald Trump.Just google Youtube. Looks like our local politician's foot in the mouth disease has spread to the US.). Another concern is whether U.S will trigger a interest rate increase to end the super low interest rate regime or that US will be forever addicted to it. 7) Malaysian household debt is super crazy for a very long time. Property prices is stagnant at best and developers find it hard to get buyers and buyers even harder to get loans from banks! With the falling ringgit, will BNM increase the interest rate to stem ringgit outflow? GST is reducing the rakyat's spending power while increasing anguish. 8) I bet many Malaysian don't know that most of our sovereign debts owners are FOREIGNERs. If they unwind...we are in deep !@#$. 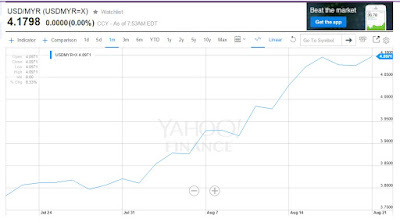 If ringgit continues to fall, surely it will be a severe lost to their investment. Or we can wait for brotherly foreign middle east nation to do some Billion dollar donation to save our country from economic despair? 9) Our current political situation is not very bright to say the least. With the planned Bersih4.0 rally (what a way to celebrate our Merdeka day) looming soon next week, anything can happen but what is certain is that our economy outlook perception by foreigners will be a further big negative development either way it goes. 10) Lastly, there is NO new economic catalyst to spur the economy. The only small bright side is the semicond, E&E sector & exporters to profit due to the strong USD. Pray hard for our nation and its people. 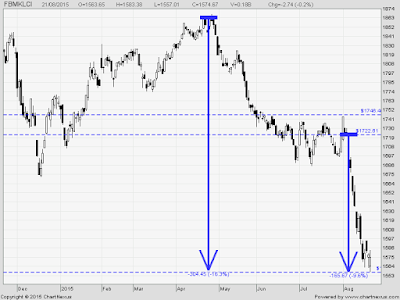 Or buy put warrants or short the KLCI especially when violatility is high. Last Friday's action - DOW Plunges 500 points aka ~3%.